Today’s post will discuss visual and perceptual problems that are common in our loved ones suffering from dementias and Alzheimer’s Disease. These problems fall into three main categories: vision, perception, and hallucinations. Vision problems occur as part of the normal aging process. However, because the brain plays such an important role in how and what we see, the aggregate damage from dementias and Alzheimer’s Disease exacerbates and disproportionately magnifies the normal age-related vision problems that older people develop. Two common age-related vision problems are cataracts (clouding of the lens inside the eye that decreases vision) and macular degeneration. 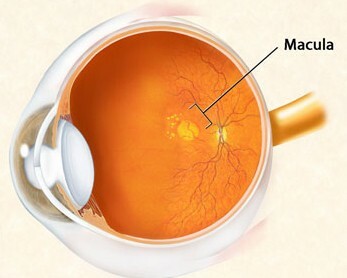 The macula is located behind the eye in the center of the retina. Although the macula makes up just 1/20 of the entire retina, it is responsible for the sharp, clear, and undistorted detail of central vision, which enables us to read, recognize faces, drive a car, and watch television. There are two types of macular degeneration. 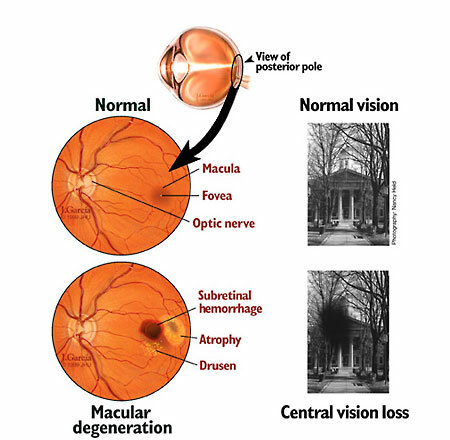 “Dry” macular degeneration is how age-related macular degeneration starts and drusen (German for “small dots”) begin to form in the retina around the macula. It is important to note that the presence of drusen does not necessarily mean that macular degeneration will eventually occur, nor does it mean future vision loss. However, if drusen continue to form, then dry macular degeneration will occur. The good news is that the progression of this form of macular degeneration is very slow and noticeable visual impairments usually do not occur for several years. However, when they do occur, the same field of vision problems that sufferers of wet macular degeneration experience will be present. “Wet” macular degeneration, on the other hand, is more serious and can result in immediate and severe vision loss. Wet macular degeneration occurs when blood vessels burst in the retina and fluid and blood leaks result in cell death. While there is no treatment to reverse – although vitamin supplementation may help slow the progress – dry macular degeneration, there are very effective treatments to stop the fluid and blood leaks and prevent damage to the eye at retinal eye centers for wet macular degeneration. This is a serious vision condition that needs to be treated immediately. I bring these up because my mom had dry macular degeneration in one eye (her stronger eye) and wet macular degeneration, which we treated aggressively up until her death, in the other eye (her weaker eye) before she was diagnosed with vascular dementia, Lewy Body dementia, and Alzheimer’s Disease. And I know, with the damage to other parts of her brain from the dementias and Alzheimer’s Disease, the visual distortions caused by these common age-related vision problems were exaggerated. It’s important to know this is not uncommon with our loved ones suffering from dementias and Alzheimer’s Disease, and is part of what makes the whole process a losing battle from the get-go. One of the most noticeable visual distortions associated with dementias and Alzheimer’s Disease is characterized by sudden stops at door thresholds and on walking surfaces where there are delineated changes in color and consistency, such as going from a wood or tiled floor onto carpeted floor. These are known as “visual cliffs,” and, interestingly, the same phenomenon is observed in infants as they begin to crawl. What causes these abrupt stops are abnormal depth perception and a fear of falling. The ability to accurately perceive depth seems to erode in proportion with the increased damage to the brain caused by dementias and Alzheimer’s Disease. An unexpected benefit of this, however, is that caregivers can use this visual distortion to help control wandering by putting “cliffs” (a two-inch piece of black tape) at the bottom of and on the thresholds of exterior doors. This is typically pretty effective. Illusions – what the person sees is a “distortion of reality.” This most likely occurs because of a particular characteristic of an object, such as a shiny surface or a patterned print. An example of an illusion would be seeing a face in a curtain with a pattern. Misperceptions – what the person sees is a “best guess” at the inaccurate or distorted information the brain has received from the eyes. An example of this would be believing that a shadow on a sidewalk is a hole in the sidewalk. Misidentifications – damage to specific parts of the brain will cause problems identifying objects and people. For example, distinguishing between a daughter or son, sister or brother, mother or father, and a spouse becomes difficult and then impossible. If we, as loving caregivers, can better understand the what and the why of the visuoperceptive difficulties inherent in dementias and Alzheimer’s Disease, then we are better equipped to adapt our loved ones’ environments to make those environments as comfortable, as non-threatening, and as “safe” as possible. We’ll never be able to completely eliminate the effects because the diseases are bigger than our best efforts. getting lost or disorientated, even in familiar environments. Visuoperceptual difficulties also lead to problems moving around. These problems make our loved ones fearful of falling and, as a result, they tend to dramatically slow down their movements while they try to walk safely. As loving caregivers, we should learn to anticipate these situations, help explain what is being encountered, offer our arms for support, offer encouragement and slow down our own movements to match those of our loved ones. avoiding walking on shiny floors because they appear wet or slippery. As caregivers, we can help minimize some of the effects of visuoperceptive difficulties for our loved ones suffering from dementias and Alzheimer’s Disease in several ways. The first way is to ensure that our loved ones get regular eye health checkups and that any age-related vision problems that can be treated are treated immediately and aggressively. A deliberate use of colors can help with diminished contrast vision. For example, a green plate on a white tablecloth is much easier to see than a white plate on a white tablecloth. Additionally, changing from a standard white toilet seat to a colored toilet seat will make the toilet seat easier to see. We can also use color to highlight important objects and orientation points (for example, the bathroom door). Improving the lighting levels in our homes will also help our loved ones, and ensuring that lighting is even around the house will minimize shadows and “dark areas,” making navigation and perception easier. Use solid colors instead of patterns in flooring, carpeting, and runners to give a safer environment for navigating the house. If mirrors and shiny surfaces cause problems with illusions and misperceptions, then remove those that are practical to remove and cover the rest. Be sure to close curtains or blinds at night. How we respond to our loved ones with visuoperceptual difficulties is perhaps the most critical part, in my opinion, of showing our love for them. I have always had a very tender and gentle side, but I never showed or saw much of it myself until I took over the responsibility from my dad of taking care of Mama and making sure she was comfortable, safe, protected and okay. Our responses should be calm and loving always. And this can be challenging, especially when we’re tired or aggravated. I am stating an ideal that I didn’t always attain with Mama. But it’s our goal to do this. We can explain what the object is used for or who the person is, but if it doesn’t work, let it go. It’s far more important to listen to what our loved ones are saying – and encouraging them to converse and participate in activities – than it is for us to be right. When our loved ones don’t recognize people, we can ask friends and relatives to introduce themselves to our loved ones. Not recognizing people can be very distressing for our loved ones, and it can be upsetting for the people who are no longer recognized. However, in the end, our job is to make sure our loved ones feel safe, encouraged, and supported. This is not their fault, so criticism or trying to force them to do something they are mentally incapable of doing is cruel and will often make our loved ones retreat from interaction with us and others. That does no one any good. Hallucinations also fall into the vision category because our loved ones often see people who are not there or people who have died as if they are alive and in the room with them. Mama saw Daddy regularly, even though when she started seeing him, he’d already been dead for ten years. She also saw friends and family from her earlier years from time to time. And she saw people going in and out of her apartment (usually a young boy and girl, who’d go in when she left, and leave just as she came back in) just before her psychiatric hospitalization and the subsequent diagnoses of mid-to-late-stage vascular dementia and Alzheimer’s Disease in 2010. Most of the time, she told me about these “visits” after the fact, but two hallucinations happened with me there when she was living with me. And they floored me, but instead of insisting there was no one there, I let her talk about them, which gave me time to formulate honest answers to her questions about them without hurting her or dismissing her. The first happened just after she’d awoken one morning and I was sitting on the bed with her holding her hand while she woke up. I was speechless when she pointed to the bookcase just to the left of the bed and she asked me, “Do you see those two angels over there?” I told her I didn’t, but I encouraged her to tell me what she was seeing. She wasn’t scared and she seemed to be happy “they” were there. As soon as Mama was fully awake, they were gone. I closed the door with both of us in there. When we were done, I opened the door to help her back to bed and she asked me if the man had gone upstairs. I nodded. She relaxed and went back to bed and back to sleep. When she awoke the next morning, she didn’t say anything about the man right away. But when we were eating breakfast, she asked me where the man and the children – there were no kids the night before – were. I suspected she was thinking of Daddy and us as kids, so I told her everyone was gone and just the two of us were there at home. That ended it, but it didn’t end the hallucinations that I continued to hear about right up until her death. I was initially very conflicted about how to respond to Mama about the hallucinations because I knew they weren’t real and I believed I would be dishonest if I gave any indication that I thought they were. However, I realized the hallucinations were real to her, even if I knew they weren’t really happening, so I encouraged her to talk about them in a way that didn’t lead her to ask me questions because I wasn’t sure how to answer them. And I found that to be the best approach. She wasn’t afraid, she didn’t shut down, and she didn’t feel threatened by my response. And I heard some pretty interesting stories in the process. It was win-win. 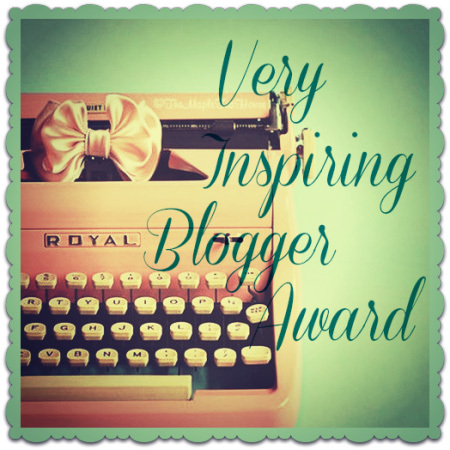 My next post will tackle some of the psychoses that our loved ones suffer with dementias and Alzheimer’s Disease. While not all of these are negative – I will give some specific examples – many of them are and they, in my opinion, are one of the toughest aspects of these diseases to deal with rationally, lovingly, and calmly. But it can be done and I will pass on some tips and lessons I learned in the process in the hope that it will help you. My brother had and still has Hallucinations. He sees invisible people everywhere. He would get mad when I would not let this man and woman that lived out in our camp trailer come in and eat with us. He would take snack food to them later. You had to laugh to yourself sometime about the people he saw, but actually you were crying inside. So sad. Lewy Body dementia is most often associated with on-going visual and audio hallucinations, but this is a step in all dementias. Understanding why they are occurring helps, I believe. I was never sure which type of dementia my brother has. Perhaps it was Lewy Body.